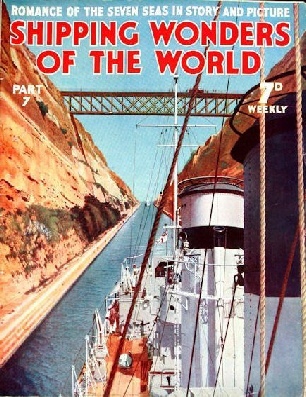 Part 7 of Shipping Wonders of the World was published on Tuesday 24th March 1936. 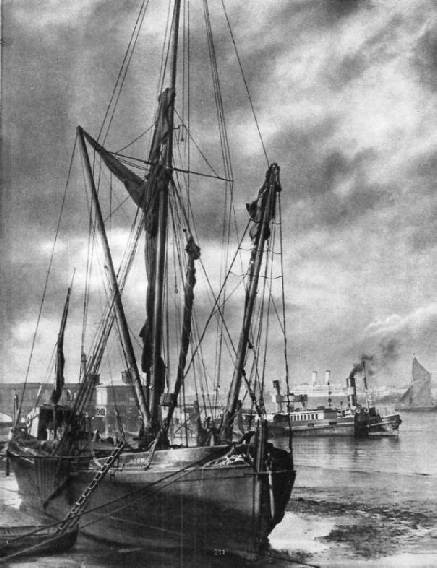 It included a centre photogravure supplement featuring the Port of London, which formed part of the article on London’s Link with the Sea. The cover of the current number shows HMS Duncan (displacement 1,400 tons) leading the First Destroyer Flotilla through the Corinth Canal. The canal is about 4½ miles long and 26 feet deep; ships must not exceed 6 knots. The cover was later reproduced as the colour plate in ipart 37, to accompany an article on the Corinth Canal. Click on the image to see a short clip from a British Pathe newsreel. 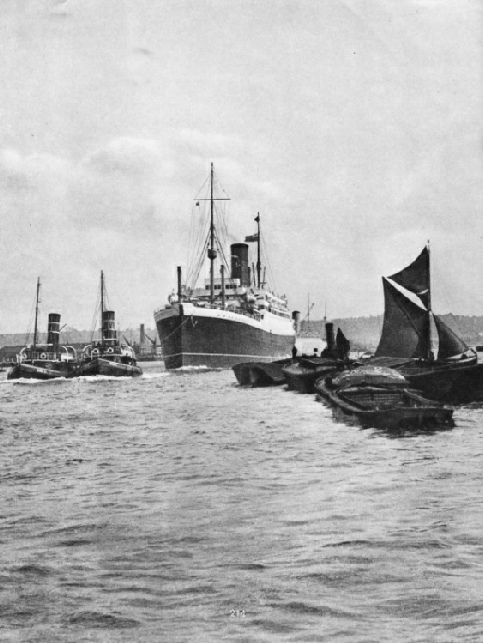 It shows the Trevessa heroes arriving home, with “a wonderful welcome accorded to Captain Foster and his gallant comrades who spent more than 3 weeks in open boats before reaching safety”. The article is concluded from part 6. “For New York left Southampton”. This is the brief announcement of a liner’s departure. But before sailing day arrives organizations are at work to prepare for a voyage that may take six days or six weeks. This article is by E. Burnand Mount. The illustration above shows the liner Normandie leaving port. Life at sea was formerly a strange mixture of hardship and comfort. Some ships, because of the barbarous conditions in which their crews worked, were known as “Hell Ships”. Other vessels, even in the days when a career at sea was inseparable from hardship, were comparatively comfortable. The story of the Gatherer (otherwise known as the Bloody Gatherer) can be read here. This chapter was written by Frank Bowen. The photogravure supplement in this issue complemented the article on the Port of London with three photographs. The illustration, taken near Gravesend, depicts the Thames at the Tilbury-Gravesend ferry, and in the background an Orient liner at the Tilbury landing-stage. 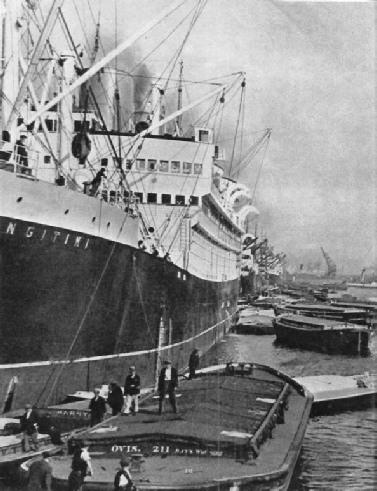 The Tilbury Docks were opened in 1886. In 1929 extensive work was undertaken to improve them. The water are of the Tilbury Docks is 105 acres, the maximum depth is 42 ft 6 in. They are used chiefly by the Bombay and Australian steamers of the P. and O., the Orient, Clan, Harrison (Calcutta service), Bibby (homeward bound) and Ellerman Lines. Click on the small image to see a British Pathe newsreel clip showing the construction of new facilities at Tilbury (1929). To the Port of London come large ships and small ships carrying passengers and cargo along its sixty-nine miles of waterway. More than one-third of the overseas trade of the United Kingdom is handles by the Port of London. This is the second article in the series Great Ports of the World, and it was written by F. A. Bex. A BUSY SCENE AT THE Royal Albert Dock which is a part of the group known as the Royal Docks. 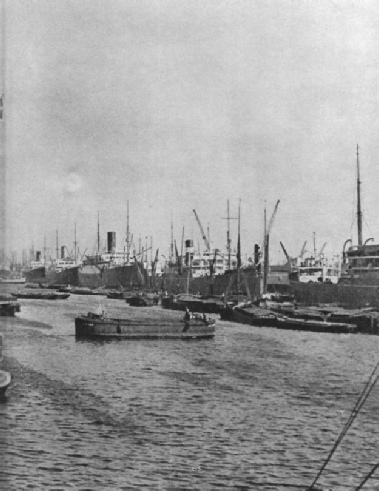 The Royal Albert Dock was opened in 1880. The Royal group forms a three-mile stretch of water parallel with the fairway. The system is the largest in the world with a total water area of 245 acres and about thirteen miles of quays. Regular services are maintained to and from the Royal Docks by many of the big shipping lines, and vessels sail from here to all parts of the globe. As many as half a million tons of shipping have been known to be in these docks at the same time. Click on the small image to see a British Pathe newsreel clip showing a new berth for bananas in the Royal Albert Dock (1938). This ship is called the Criollo Fiel or more familiarly, Faithful Creole. She was built on the Tees at the yard of the Furness Shipbuilding Company, to the order of the Standard Shipping Company of New York for one of its South American subsidiaries, and designed for service on the Parana River. We have called her a tropical service ship because she is almost identical with those vessels which bring the crude oil across shallow Lake Maracaibo (Venezuela) to the refineries at Aruba. This is the fourth article in the series on Merchant Ship Types. Rumours of lost treasure have for centuries enticed men to set out on quests that have sometimes brought them profit, or sometimes sent them to their deaths. In recent years Cocos Island, in the Pacific, has held out an ever-beckoning finger to adventurers. 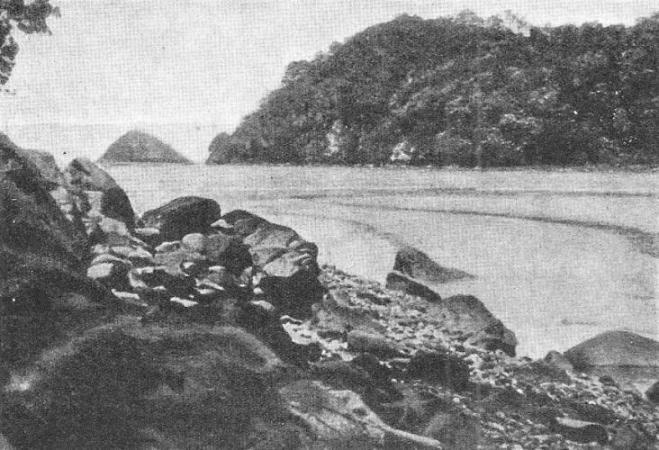 The photograph above shows Wafer Bay, one of three possible landing-places on Cocos Island. The other tow are Chatham Bay and a third bay, unnamed, on the south coast of the island, which is of no use as a harbour sine it is exposed to the surf. Wafer Bay suffers from a heavy swell at certain seasons, and so Chatham bay is preferred by treasure-hunters. About 1883 a concession to search the island for treasure was granted by Costa Rica to a German named Gieseler, who was also appointed Governor. Gieseler settled at Wafer Bay and lived about twenty years on the island with his wife and a servant, but he did not find any treasure. This article is written by Sidney Howard and is concluded in part 8. OUTWARD BOUND - a Cunard White Star Liner photographed off Greenwich at high tide. There are moorings above Greenwich Pier for large ships, and sometimes during the summer large cruising liners of foreign companies use these moorings while their passengers visit London.